In all likelihood, the debate began soon after the creation of the second fly. It’s human nature to make lists, and we rank everything from influential world leaders to sports bloopers. What makes rankings debatable, and interesting, is that we all have our own criteria and opinions. Fly fishermen are no exceptions. We all rate our own favorite flies in a multitude of categories; favorite attractors, dry flies, streamers, etc. One very valuable list would be most versatile flies. What would it take for a fly to make your list of most versatile? Many common choices come to mind for me: the Adams, Hare’s Ear, and Woolly Bugger for example. Each of these flies is commonly thought of as a trout fly, but in actuality one characteristic that makes each versatile is they are effective for many species. They are also consistent producers around the world and throughout the seasons if there is open water to present a fly. These are certainly valuable characteristics of a versatile fly. How useful would a fly be if it imitated a food source available around the world, year round, and relished by many species of fish? The prey item I’m thinking of is the crawfish. 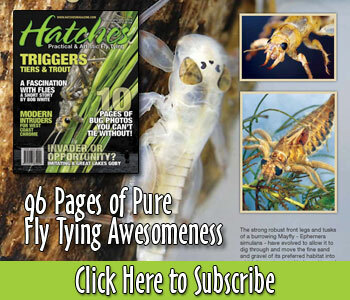 This prolific crustacean has long been recognized as a favorite food of bass, catfish, and other fish, but how many fly fishers regularly utilize a crawfish pattern? The crawfish is known to be an excellent fly for large browns, but have you considered a crawfish for rainbows, cutthroat, brookies, or lake trout? What about warm or cool water species such as walleye, carp, bluegill, crappie, northern pike, perch, and bullhead? A fly that effectively imitated this food source would certainly be very versatile! One such fly is Ritt’s Fighting Crawfish. Where’s the how to tie?